These are made in my hometown of Charlottesville, Virginia. They are sold in stores in Virginia and several other surrounding states, but they aren’t available in New York (yet), so my mother ordered some and had them mailed to me in a freezer pack! 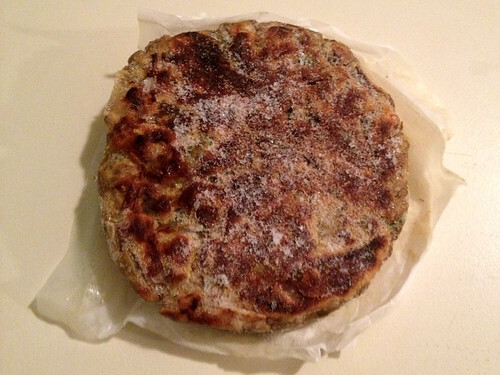 I fried the frozen patty in a frying pan with a little olive oil. It cooked evenly, and browned to a nice crisp. 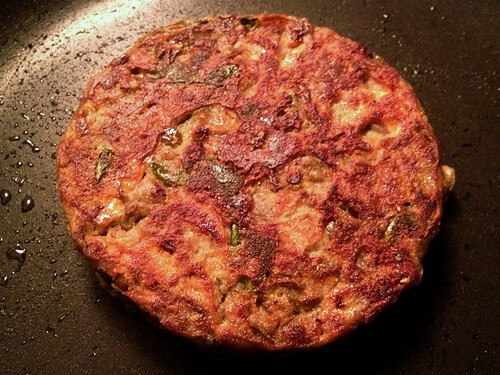 Although the patty looked soft, it held together well as I flipped it with a spatula. Keeping it simple for my taste-test, I served it on a whole wheat bun with lettuce, tomato, and mayo. Wow. 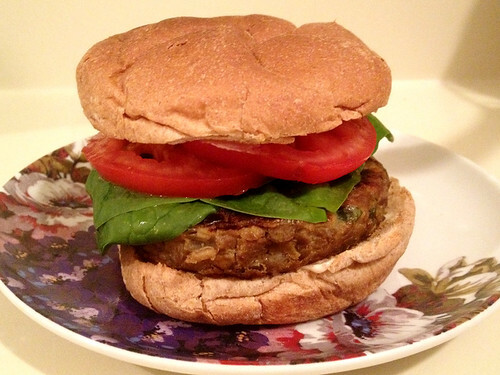 From the first bite, I was in love – the patty was a hearty, delicious blend of lentils and vegetables. 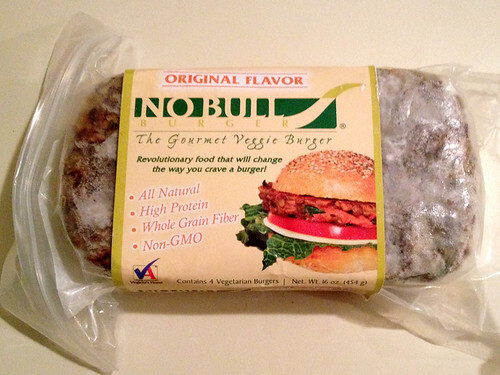 This was definitely one of the best store-bought burger patties I had ever tasted! EDITED: Please note, the "Original" flavor and the "mushroom" flavor are NOT vegan (they contain egg). The "Spicy Italian" and "Sundried Tomato" flavors, which I review next, ARE vegan though. Actually, if I had not known better, I would not have believed it was store-bought. 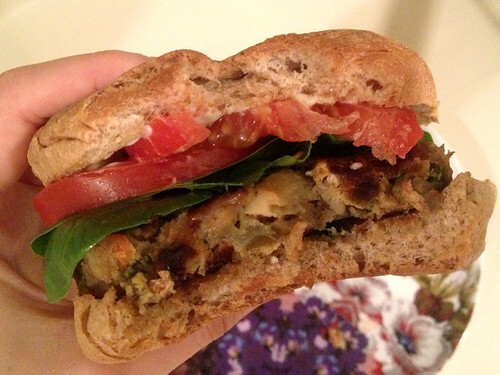 It was without a doubt the closest to home-made that any store bought patty has come. 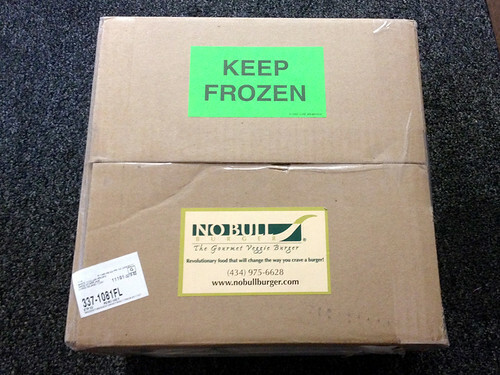 Aside from the fact that I had seen it in its frozen state only a few minutes ago, nothing about it seemed pre-packaged. I know a lot of burgers have whole lentils and pieces of vegetables in them, but these were extra large, hearty pieces that made it feel far more like something made in someone’s kitchen than on a factory line. With how delicious it was, and how easy it was to cook, this has easily earned its spot as one of my favorite store-bought burgers. I’m so glad my mother sent them to me to try! And I can’t wait to try the other two flavors I got as well: Sundried Tomato and “Mama Mia Spicy Italian”. I was excited to place an order but the $20 (yikes!) shipping fee to NY dissuaded me. Will make do with the pics for now! Looks truly delicious, I must admit! I love to make similar ones at home, but good to know they can be bought in store in high quality to save time when needed. I am trying include as many vegetarian food to my diet as I can and this will definitely help me with getting there. Also, I am aspiring to move onto partial raw diet combined with vegetarianism. These are the restaurants Best Raw Restaurants I am going to try next weeks, so I can get inspired what I should prepare at home. 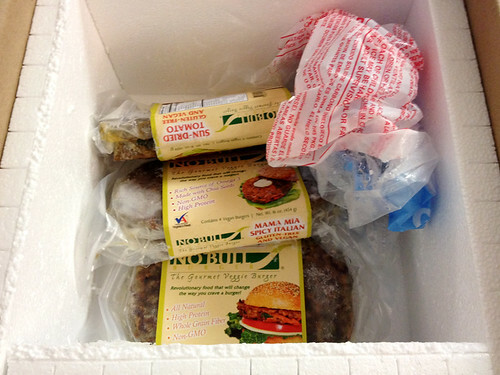 I love these burgers, too, but I don't think they're vegan. The original and the mushroom & garlic have egg. Hi Silva, thanks for pointing that out! I looked at the website again and you are right, only the "spicy Italian" and the "sundried tomato" are vegan.